‘Happiness is an inside job’ as what a recurring quotes runs.It means that your’e being happy depends on external factor. Its something that you chose or decide.That happiness is experience inside us.Its also has its source within us. 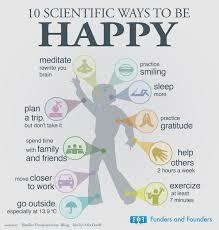 There were 10 scientifically proven ways to be amazingly happy based on a social media site called Buffer. Below are the list. Exercise can help you relax, increase your brain power, and even improve your body image, even if you don’t lose any weight. Smiling can make us feel better, but it’s more effective when we back it up with positive thoughts. Our commute to work can have a surprisingly powerful impact on our happiness. There are lots of ways to practice gratitude, from keeping a journal of things you’re grateful for, sharing three good things that happen each daywith a friend or your partner, and going out of your way to show gratitude when others help you.